Americans recognize the importance of critically evaluating what they hear from public officials. Here is additional information regarding Don Horton's op-ed about Bend Park and Rec's (BPRD's) proposed bridge across the Upper Deschutes. The Upper Deschutes has special protections via its designation as a state scenic waterway and federal wild and scenic river. One of these protections is a prohibition on bridges, intended to avoid heavy use and associated impacts on the area. House Bill 2027 would elevate the "no bridge" protection from administrative rule (OAR) to state statute (ORS). Horton says HB 2027 would pre-empt public engagement processes. A 2015 public process was undertaken by Oregon State Parks in response to a request by BPRD. After receiving public input, Oregon State Parks declined BPRD's request to remove the bridge protection. A second, broader, process was held in 2017, and Oregon State Parks again denied BPRD's request. BPRD has indicated it would proceed with the bridge regardless of the outcome of Oregon State Parks decisions. HB 2027 is necessary, precisely because BPRD will not abide by existing protections and associated public processes. Horton's op-ed asserts that HB 2027 could "Stop the completion of the Deschutes River Trail" (DRT). One portion of BPRD's proposed DRT routing would be affected, but the DRT already exists between the City of Bend and the Deschutes National Forest via the "haul trail." The haul trail section is not immediately adjacent to the river, but neither are several other sections of BPRD's DRT routing. BPRD is trying to channel hundreds of thousands of residents and visitors into a small area that is intentionally protected from such heavy use. Alternatives can be found. Horton asserts the 2012 bond measure and BPRD's survey results indicate overwhelming public support for the bridge. However, BPRD's own summary of the bond measure made no reference to a bridge, and their survey results are not suitable for policy decisions due to the lack of contextual information provided to survey completers. Information matters, and transparency regarding the bridge likely would have dramatically changed survey results and possibly even the outcome of the bond vote. Horton says BPRD's "Preference is always to negotiate and work together on solutions," but BPRD has had 20 years to meaningfully engage with those opposed to the bridge in order to understand, address, and, most fundamentally, respect their concerns. That hasn't happened. I support trails and trail connectivity, and I would like BPRD to facilitate good trail options for all residents, including those in southeast Bend. However, not every trail is a good one. We need creativity, flexibility, and respect for others in this community, especially in a public agency with so much money and power. I encourage BPRD to exhibit these qualities as they work to complete the DRT. The opinions expressed here are entirely my own; I do not speak for any organization. Oregon law does not provide any protection to a tenant who destroys the landlord's property. The tenant can be held 100 percent liable for any damage to the property. Stealing the personal property of a landlord is the same as stealing from anyone else, a crime for which the police should arrest the tenant who allowed/caused it to happen. Tenants assume legal liability for the actions of or damage by anyone they invite/admit onto the property, as any insurance agent will confirm. Deschutes County's DA really needs to have a sitdown with Bend Police to revamp their inadequate response to this increasing calamity for our most defenseless homeowners, before landlords are forced to "police" their own situations. Oregon law provides that a homeowner may use whatever force deemed necessary to protect their person AND property from an immediate threat or harm. The solution is to remove many of the regulations on business in Oregon thus opening up more jobs. Oregon is notorious for being hard on business. In Bend I know of three people in the last year that for several reasons have left the state, but all three said one reason was increased rules. One was a contractor, one closed a restaurant and left, and the 3rd was a long time ranching family. They all stated how tired they are of the state legislature and some of its really bad rules, laws and bills they've proposed. Also all the incredible waste of taxpayer dollars by the state legislature has many people really disgusted with Oregon. Add in the recent demonstrations in Portland that did nothing but harm more businesses, and people are just fed up. Glad to hear stories about people leaving the state. Rent control is the best thing for the most people. Any other argument is greed based. Helen, stop beating a dead horse. Do we all use the services of the Pavilion, the Senior Center, Juniper Park, the urban trails and parks? No. But we pay for it and we're happy for those that do enjoy it, whatever their niche, because we're a vibrant, progressive community who thinks for all, not just me, me, me. Robert – Thanks for your letter. 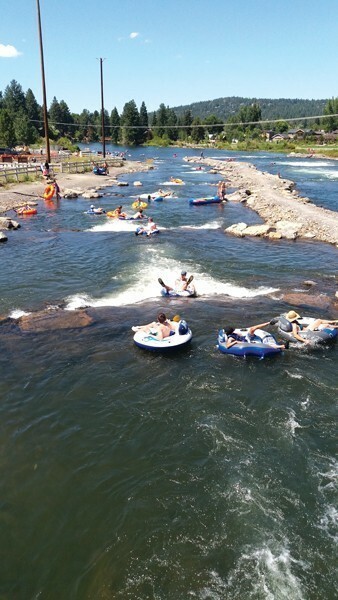 While this is not us coming out for or against the whitewater park, you get the letter of the week for proposing that we start "thinking for all." Come on down for your gift card to Palate.